Tetris turns 25: Is it the next Olympic sport? Pajitnov: "It's a very simple game and it has a really strong creative spirit in it"
(CNN) -- It's amazing how a huge global phenomenon can begin. Tetris, the simple puzzle video game, has been addicting players for 25 years. In 1984, Russian mathematician Alexey Pajitnov was playing with one of his favorite puzzles when he had an inspiration: How about creating a computer version? Pajitnov wrote the program in his spare time, simplifying the idea to make it easier for those of us who aren't math geniuses. He used shapes made of four squares -- hence "Tetris," which comes from the Greek word for four, "Tetra." Steadily, the game worked its way around the world. Millions of people found themselves glued to their computers and game players -- hearts racing and screaming in frustration -- all over getting a simple horizontal line of digital squares to disappear. Vetsch became so obsessed with Tetris that the game even showed up in his dreams. Watch Josh Levs report and share your questions and views about Tetris. "I'd go to sleep and in my head I'd see blocks. . .going into each other," he told CNN. "It was weird." More than 125 million Tetris products have been sold, and Guinness World Records' 2009 Gamers' Edition book ranked Tetris No. 2 on its list of the top 50 console games of all time, behind Super Mario Kart. 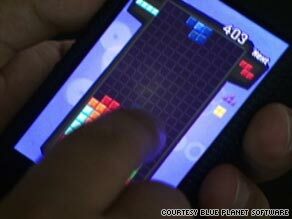 Twenty-five years to the month after Tetris was born, CNN spoke with Pajitnov and Henk Rogers, CEO of Blue Planet Software, the company that manages the exclusive licensing rights to the game. CNN: Alexey, I want to start with you. When you first dreamed up this scenario all those years ago, did you ever imagine it would turn into a global phenomenon? Alexey Pajitnov, Tetris creator: The very first time when my small game started working even without scoring or leveling, I couldn't stop playing. It's a really good game, but I [couldn't] imagine that it would be that big. Henk Rogers, CEO of Blue Planet Software: When I first found it at the Consumer Electronics Show in 1988, I kept on coming back and playing more. And that was a for sure sign that this was going to be a good game. CNN: There are stories of people going in to work on the weekends just to sit at their computer and play for hours. They even dream the Tetris shapes if they play for too long. Could one of you explain to me why it's so addictive and what goes on when you play it? Pajitnov: First of all, it's a very simple game and it has a really strong creative spirit in it. So instead of destroying something, you kind of build up the profile out of those small pieces and enjoy doing it. And that's probably the very important addictive factor. CNN: The simplicity and also the immediate satisfaction -- but then immediately it's time to work for the next one. CNN: Henk, tell us some of the stunning statistics. Rogers: Over 70 million products have been sold as a box product, and more recently on the mobile [market] we're almost reaching 80 million downloads worldwide. Last year 10 percent of all games on mobile phones in this country were Tetris. CNN: We have some videos of takeoffs -- turning buildings into Tetris or human Tetris. Is that great publicity or are you concerned in a legal way, like, "Stop grabbing our name and doing what you want with it?" Rogers: It's all flattery. I like it. CNN: Alexey, you were originally unable to make a penny off of this for a long time. What happened there and how did it ultimately pay out for you? CNN: You all put something into your news release: "We have a vision of the future where people all over the world can meet and become friends without speaking the same language." You go on to say that people will be "connected through the universal language" of Tetris. Are you guys being sarcastic about that or is that an actual hope? Rogers: No that's a real dream for us. Games are a universal language and Tetris breaks all culture, language and age and gender barriers. CNN: Have you had complaints from people saying that Tetris is a drug, that it's more addictive, there should be some kind of warning with it? Pajitnov: It happens to me all the time. People approach me and say, "I spent so much of my college time on Tetris I almost blow my exams." And I usually ask, "But was it good hours which you spent on Tetris?" And everybody say, "Yes it was really good hours." So I say, "I not waste it, I gift it to you!" Rogers: I think that Tetris is the first virtual sport. And we'll see a Tetris Cup in the future and international competition. Hopefully we'll be part of the Olympics someday. CNN: The actual Olympics? The Olympics Olympics? Rogers: Sure, why limit the Olympics to physical sports? Why not mental sports? CNN: Wow, that would open up a whole new realm. I know you have a lot of plans for building this. What will we see when we envision the future? Will there be 3-D Tetris? Or will I have goggles and play virtual Tetris? Rogers: Tetris is the ultimate casual game, so we need to keep it simple. If 3-D takes it out of simple-to-understand games, then it probably won't go there. CNN: You want to tell me how much you have made off Tetris over the years? CNN: Alexey, how about you? Pajitnov: Yes, I am happy. CNN: Enough to give Oprah a run for her money? CNN: No, I don't think real people do that ever. Have memories of Tetris? Send us iReports or join the discussions at Facebook or Twitter.